Witraże - pracownia witraży Vitrogal, przeszklenia, zdobienie, naprawa i modernizacja termiczna. The "Vitrogal" Company has been operating since July 1990, executing orders placed by domestic and foreign clients, mainly from Germany, Switzerland, Luxembourg and Sweden. Thanks to our participation in fairs and exhibitions, for instance in the international craft exhibition "Mu - Ga '92" in Mulheim (the former Federal Republic of Germany), where we had the opportunity to show our goods for six consecutive months, or in the fair of entrepreneurship and craft "Inter-Region" in Prudnik in 1996 as well as in subsequent editions of the construction and building fair in Opole, we have won a significant group of clients both institutional (joiners, producers of PVC joinery, construction companies) and individual ones. In 1996 we were granted a protection certificate by the Polish Patent Office that covers our trade mark. Following our accepted standards, we have been making stained glass using the Tiffany method since the very beginning. It enabled us to quickly start the production of triple-glazed insulated units in which stained glass is the internal panel. Copper foil and tin soldering offer us greater artistic and technical possibilities than traditional stained glass with lead came (lead profiles). 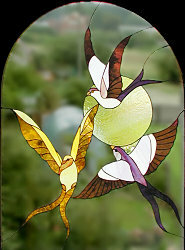 We make stained glass of a surface of up to 2 square metres as a uniform panel for a triple-glazed insulated unit of a typical width of 24 mm, single stained glass panels for interior installations, and backlit stained glass pictures in wooden frames that combine the beauty of a picture and the charm of colourful light. We are also ready to proceed with any glasswork related to renovation or thermal modernization of stained glass windows. Numerous examples of our work include renovations of stained glass in a restaurant "Zajazd Kasztelanski" in Opole and in a parish church in Grudzice (the suburbs of Opole), where we replaced the old and damaged lead came with copper foil and soldering in the Tiffany method. It let us remove the steel backbones of these stained glass windows and put them in triple-glazed insulated units in new PVC joinery. We have specialized in the triple-glazed insulated units since 1993, becoming experts in this field. In recent years our offer has extended to cover also stained glass made of bevels. They look equally good in doors and windows of small single-family houses, luxurious mansions and old tenement houses. You can also place them in your furniture, be it in your living room or kitchen. We are proud of the customer service that we have maintained for over 14 years now. All customers can expect the stained glass they ordered ready within one month, regardless of the complexity of artwork or technical challenges it poses. We guarantee that our triple-glazed insulated units will remain air-tight for at least 5 years.